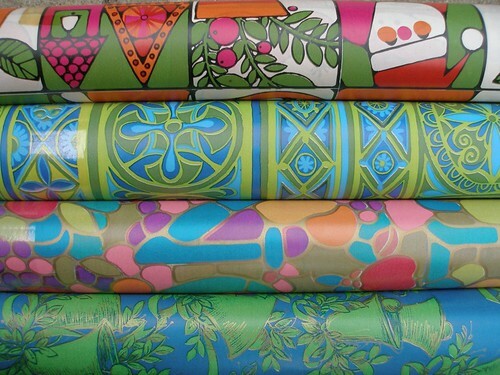 Vintage Wrapping Paper, originally uploaded by the workroom. Every so often, when the moons align and Jupiter is in just the right house, a special portal opens up and delivers the mother load of found treasure. When you find this rare portal, you can often return on multiple occasions to find the treasure replenished. There might be more. While I was at the shop today, they got a dumpster bin and filled it to the brim. When I walked by tonight, I refrained from jumping in, due to there being witnesses. (who also happen to be my neighbours) This is where one of those invisibility cloaks come in might handy. If only I could find one of those. 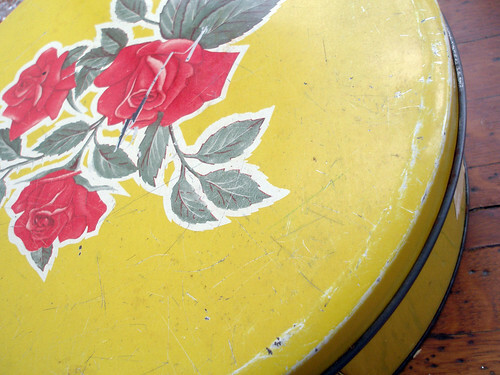 also – i got a really cute vintage cookie tin at a yard sale for 50c a few weeks ago. i decided to put it in the dishwasher to sanitize it – bad idea! all of the paint peeled right off… boo! lesson – no dishwasher for vintage tins. angelune – I know, how selfish of me! We should start a garbage scout map for Toronto. I always find stuff that I don’t take and wish I could tell people about it. I’m sorry to hear about your tin. That’s good advice though.